A restaurant blueprint has to meet several different types of criteria, including zoning laws for the town the restaurant will be in. The design also has to turn a profit for the restaurant owner, meet the needs of the restaurant’s employees and provide a pleasant atmosphere for patrons. Making the design is thus a tall order, but you can hurdle it by studying existing restaurant plans and getting an objective view of your plan. The primary benefit of a successful blueprint is the personal satisfaction from seeing the profitable restaurant built from your plan. Get a list of zoning restrictions related to restaurant construction from the zoning board of the town the restaurant will be in. Sketch a view of the restaurant‘s exterior. You can make the sketch from photos of existing restaurants similar in theme and location to the one you’re planning. The sketch helps you visualize the completed restaurant, and guides the design of the restaurant floor plan, which is also called a blueprint. You’ll now start making the floor plan itself, which is a top view of the restaurant’s interior. Draw a rectangle on paper whose sides have the same proportion as those of the restaurant you drew in the sketch. You can simplify this task by using a scale of 1 foot to 1 inch or 1 centimeter. How Much Room Do I Need for a Restaurant? Write next to each edge the length of the edge. Do this for each remaining edge you draw in the blueprint. Draw line segments to representing the top view of the interior walls of the rooms the restaurant needs. You’ll need walls for the kitchen, bathrooms and offices. You’ll also need to refer to the zoning law list you made in Step 1, to avoid putting in walls that violate building code. If you need more rooms, draw the walls for them. Draw the top views of the doors, stoves, refrigeration units, sinks, and toilets and sinks of the bathrooms. 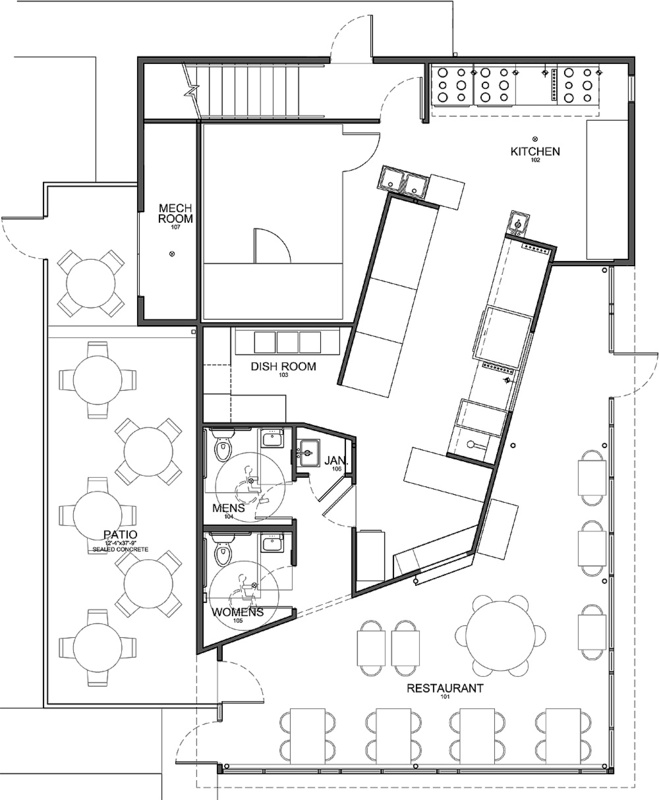 You can learn how these plan views appear by viewing existing blueprints for restaurants. Find those blueprints on sites like those of La Muse Interior Design, the Grup USA and EV Studio. Draw plan views for customer booth seats and other fixtures you need. Draw on separate pieces of paper the plan views of tables and chairs for the customers, and other movable items. You’re drawing these on movable pieces of paper so you can experiment with different layouts. Compose a floor plan layout by moving the plan views you drew in the previous step to positions you think will accommodate the criteria mentioned in the Introduction. Evaluate your layout by first taping down all loose pieces of paper, then propping your floor plan against a wall. Take a 10-minute break and do something that engages your mind, like playing a video game. Return to look at your plan and complete the next step. Write, as you look at your plan, a brief hypothetical story of the toughest restaurant critic in town as she comes to dine at the restaurant. Relate this critic’s impression of the décor, the amount of space she has to walk around and dine in and any other impressions that relate to the layout you made. Revise the plan with the critique you just wrote, then write another critique. 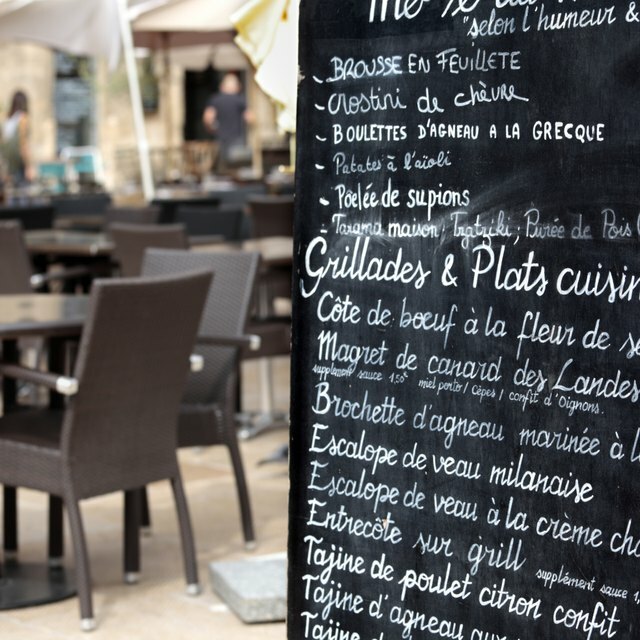 Repeat this and the critique step as often as needed to complete your restaurant blueprint.